The above listed item is from the Third Intermediate Period(1075-715 B.C.E.). This incredible "Mummiform Anubis" was cast from clay and was covered with blue green faience glaze. 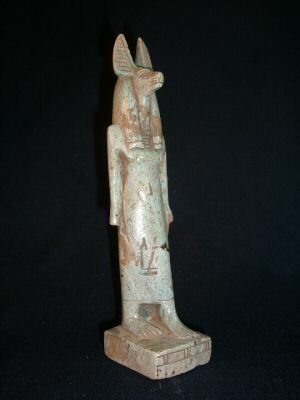 We acquired this item from a very large private collection in Luxor, Egypt. The front has a very visible inscribed row of hieroglyphics and it has retained most of its beautiful faience glaze! This type of figurine was usually placed in the tomb of the deceased. The piece is intact with age wear. The reason for the item being available is due to the vast extent of old archeological findings, thousands of years in Egyptian burials and also the proliferation of these said items in private collections worldwide. Sothebys. December 2000. 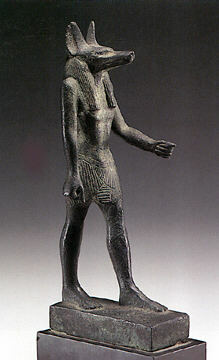 Bronze figure of Anubis, 26th Dynasty, 664-525 B.C. 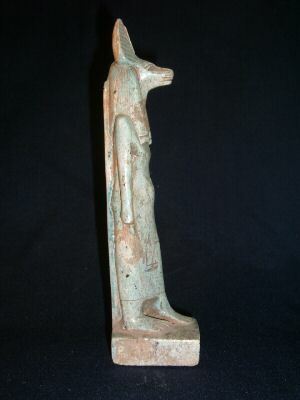 The 6 3/16-inch-high statue shows the jackal-headed god striding. It sold for $23,750.